Walt Disney was a man who had an amazing ability to inspire other people to remarkable creative achievements. Toby Bluth happened to be one of those shining gems of talent that drew inspiration from the life and work of Walt Disney. 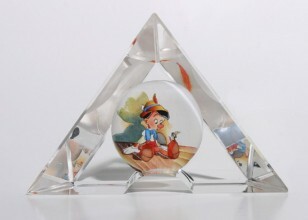 Starting with Snow White and the Seven Dwarfs then continuing with Pinocchio, Fantasia, Dumbo and Bambi, the first five feature length films to come out of Walt Disney Studios, according to Bluth, are the five gems in the crown of animation's royal history. Creating the moment that you think you saw... is how Toby Bluth described his approach in conceiving each one of his watercolor masterpieces. Believing that how one remembers a film is often different from the actual film itself, Toby painted what he perceived as the collective memory of a film experience and taps into the emotional essence of the story. Chiaroscuro, defined as the use of deep variations in, and subtle gradations of, light and shade, especially to enhance the delineation of character and for dramatic effect, is a key component in Bluth's work. The blue shaded undercoat or chiaroscuro effect, seen in this example of his work-in-progress, adds depth, life and warm and cool shadows to each scene Bluth invites us into. Toby also referred to this process as painting the light and the air. Fumado, a word which basically means smoky, is a term Toby used to describe the notion that as things move away from you in distance or time, they get hazy and out of focus...much like our memory of events in our lives. He used this principal as inspiration in how he composed his paintings, to draw focus (or lack of) to certain elements in his work. 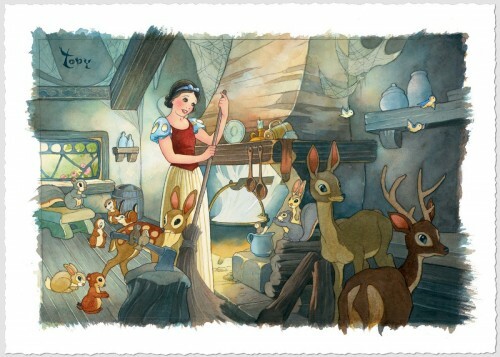 Background inspired by the work of legendary illustrator Gustaf Tengrenn, whom Walt Disney recruited to work on Snow White and the Seven Dwarfs, Bluth was passionate about his craft. A multifaceted artist, Toby's creative endeavors did not end at the tip of his brush. He was an accomplished writer, director, designer and a veteran of the American musical stage, having performed and or directed in nearly one hundred musicals, both on Broadway and beyond. 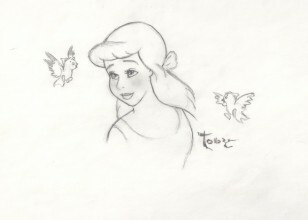 Most recently he served as Art Director for The Walt Disney Studios production of The Three Musketeers, having already served in that position for the animated feature film, The Tigger Movie.